Great thanks for the quick response. Same here. I’d love to get one of each options available so 2 lights in total. Hey Jason, sorry to bother, I submitted a comment a while back for one of each, but don’t see my name on the list, maybe I did not format the comment correctly for the script? In either case, I would love two, one of each emitter! @ dotBLF …. You made your request HERE … you’ll be added next time the list is updated. Check back to see after the update is posted here. Thank you! I interpreted other comments to mean that the list was auto updated. I eagerly await any and all updates. Thank you FW3A team for all your work, excited to see this come to life!!! Can you put me in the list? 1 x LH351D please. My name is not on the list, Can someone add me? Thanks! Now you’ve said you want a light two different times. You just want a single light, right? Just say what you want one time in this thread and that’s all you have to do. Of the two emitters mentioned as final options for this light, which one would be rosier? We have no idea until we find out what tint bin was secured for the LH351D version or someone reviews it. Could you please add me to the list, 1 x LH351D please. Is it a prototype or just an empty box? I like the logo design. Well Joechina did say ordering would start after the Chinese New Year and now we have a picture of the box. We don’t even know what leds it will have. ToyKeeper has not seen the latest prototype. Unless Lumintop has already chosen what LEDs to use and bought them and started a production run and maybe ToyKeeper has already handled the latest prototype and is just keeping quiet about it, then I would say we’re still quite a long ways from shipping a final product. I know lumintop can get the production rolling pretty quick because we’ve seen it before, but we really need to get the above mentioned items sorted out first. So, should I get my wallet ready? The second I see it come on sale/group buy, I will plunge down my money. BTW, what kind of springs will the light use? I’d love some dual BeCu springs for absolute highest performance. I do know that they are going to be used in the GT4 as I requested/suggested Texas Ace to Lumintop, so perhaps the FW3A will use the same springs. If I understand correctly, the springs are nothing special. The light isn’t designed for maximum lumens, it’s designed to be well-rounded. Super-low-resistance springs may not be desirable here. Anyway, I think Neal may have sent production samples out this week, so I can probably give more information soon. And then if the schedule holds, purchasing can probably start shortly after CNY. Then there’s the usual month or so for slow shipping. So a rough ETA for people actually receiving lights is … maybe March? I’d be the 1st one to the door for the light. How will we be buying it? Via Neal’s store, yes? Will you be receiving a final production light just to do a review or not? Any word on the size of the production run? Rough demand for FW3A based on interest list and posts must be north of 2300. Damn it. I was going to try and skip this light, but the hype train has left the station. Please put me down for one with XPLs. Thanks everyone for the work and time put into this project! This is something I have been looking forward to Get since it’s inception. I want to Say Thank You to Everyone that’s been working on Making this Happen. From the FW3A Team to Everyone of You All keeping us Up to date on this Forum and Making this Happen for us All! You All are the Best for Giving Us the Best! Were is a good place to get some for that cheap? Thanks in advance. MTN looks like a good source. The 10511 is what the FW3A will come with. Thanks. I will probably play Lego with a few of these. 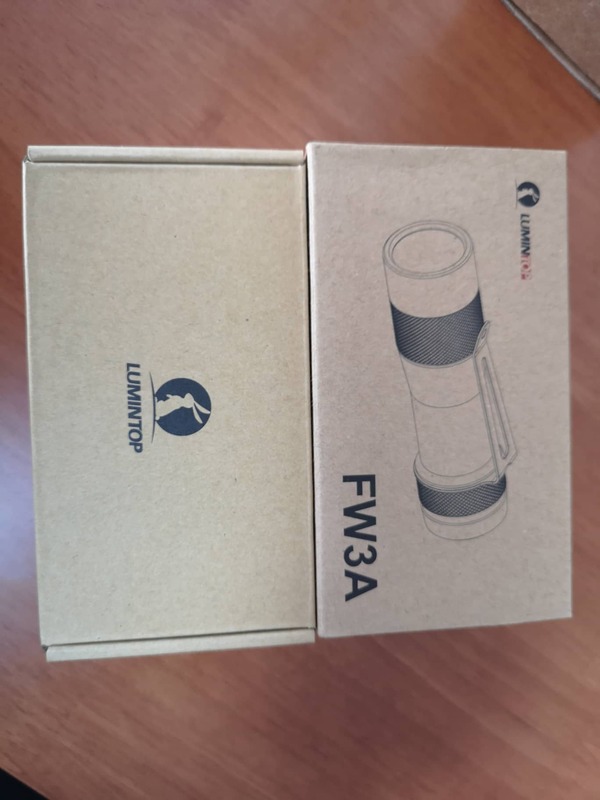 beutiful box as always from lumintop, great then means one step closer to release after chinese holidays maybe.